When we built the original Wind-up Knight, Robot Invader was only three people: Casey, our intrepid designer / animator, Mike, our one-man art machine, and me, the code guy. We hired contractors (the mighty Jordan Fehr for sound design and intrepid Josh Whelchel for music) and an intern (Patrick Wagner, now at Arachnid Games), and went from founding the company in April of 2011 to shipping in October of the same year. We managed this by leveraging Unity (though none of us had any prior experience with it) and by staging our releases (the iOS version came out slightly after the Android version). Subtracting about a month of time spent buying computers and getting office space and generally spinning up the company, Wind-up Knight was developed from scratch in about five months. Of those five months, two were spent prototyping. We’d build out a game idea in a day or two, play with it, make improvements, and then move on to something else. Almost nothing from this stage survived in the final game; if an idea didn’t work, or just wasn’t fun enough, we chucked it aside and tried something else. Wind-up Knight went through a number of crazy iterations before it settled on the platformer that we eventually shipped. A very early shot of the original Wind-up Knight. Two months of prototyping and three months of production work to make a platformer with over 50 levels in it, each with a completely unique look and feel, was a lot of work. 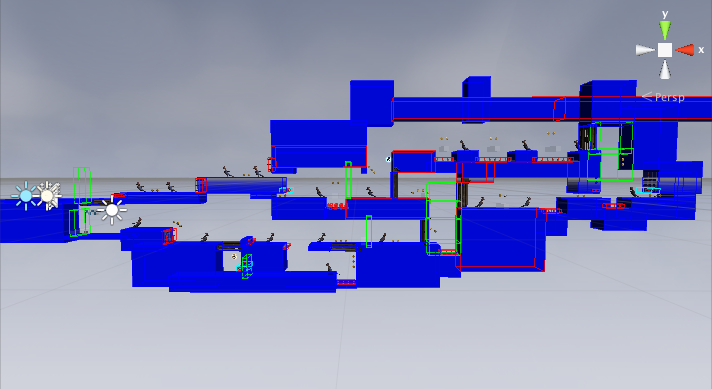 We do our level building in “blue-box rooms,” levels that have blue collision regions but no real art. The levels are designed, tested, and polished in this state, then “skinned” with art as the very last step. The skinning process is a bit like building unique structures with odd-shaped legos: we snap together bits of geometry provided by Mike to give every level a unique look while sharing lots of texture and mesh between levels. But the hardest part is the actual blue-box phase, the creation of the core level geometry. Casey, who designed every level in Wind-up Knight, spent pretty much all of August of that year in the office, working his fingers to the bone. At the end of it he had produced 52 awesome levels. He had also developed a level design workflow that included specific metrics for jump distances, spike placement locations, and wall slide heights. Casey came out of that month of hell with a head full of rules about how to make a fun Wind-up Knight level. Fast-foward to 2013 and Robot Invader is a little different. We’re four people now (the fourth is Jonny, our seasoned design director), and have shipped a couple of games. This year we split our team of four into teams and developed two games in parallel, one of which turned out to be (after a number of experiments and prototypes) Wind-up Knight 2. A shot of an unused Wind-up Knight 2 level at the “blue box” prototype stage of development. WUK2’s development has been very different than its predecessor. Rulebook in hand and a complete game at their disposal, Jonny and Casey spent several months developing levels for a new Wind-up Knight game. The prototyping phase was much more focused, as the core mechanics were already established and implemented as production-quality code. Furthermore, these levels were designed without the crazy time pressure of the first game; Casey and Jonny have been able to experiment with lots of ideas and then keep only the very best. They produced almost 100 levels, then cherry picked the most fun of the lot. When Mike and I joined their team to work on WUK2 full time, the game was already playable from beginning to end. 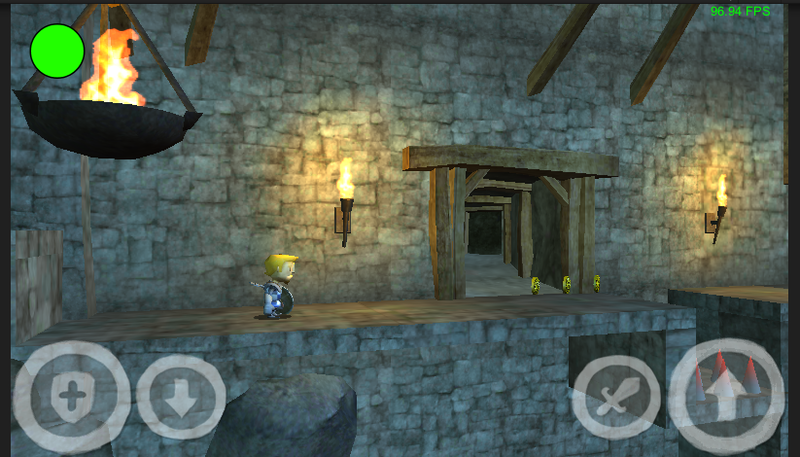 In total, Wind-up Knight 2 will probably take slightly longer than its predecessor for us to complete. But the manpower is being spent in very different ways; this time around there’s a lot more space for pushing the content envelope and polishing the design. We’re still working hard to get everything finished by the time we ship, but the core game has been rock solid for months. It’s a design process that feels very different, probably one that only works when building upon an established game. It feels good. This entry was posted in game design, prototyping, wind-up knight. Bookmark the permalink. When you and you team decide on a SDK/API for developing your mobile games, how do you go about doing this? I noticed you stated you did development in Unity for Wind up Knight. Would you continue this process for all of the games you develop for Android? What issues did you encounter using Unity to develop WUK? I’m interested in getting started prototyping a new type of top-down adventure game and I’m looking at all of the different Android game libraries out there. From what I have seen, Unity definitely seems easy enough to get started for all aspects of game development. I was also looking into Libgdx and wondered if you guys considered it at all. Just trying to pick your brain. Thanks for all the wonderful games! We’re doing all of our games in Unity for the foreseeable future. It’s a fantastic platform, easily the best game development toolkit that I’ve ever worked with. There are a few rough edges but it’s more than made up for by the incredible quality of the development tools. Probably the biggest thing is that it’s a 3D engine first (though the latest version has 2D sprite support as well, finally), and that it’s fairly large (minimum 10 mb for an empty project). For us, there’s no other engine toolchain that comes close to the same level of quality and editing power. Really really happy to listen that you’re working on WUK2! The first was one of the best games ever. And i think that the second chapter of the game will be even better. Art happens. I'm just here to witness it. Ask me about COMBAT KNIVES!